djskrimiblog From Denmark a blog about reading and writing crime fiction. Firebird Promotions A unique promotions agency-the use of arts as a method of social change and empowerment. It's a Crime! (or a Mystery…) Discussions of new crime writers and a lot more good stuff. Scandinavian Crime Fiction A blog from the Gustavus Adolphus College in Minnesota. The View from the Blue House Views on crime fiction and social matters from Rob Kitchin at the National University of Ireland. I realised with some surprise that I had only read two women authors in my first ten reads of 2013. 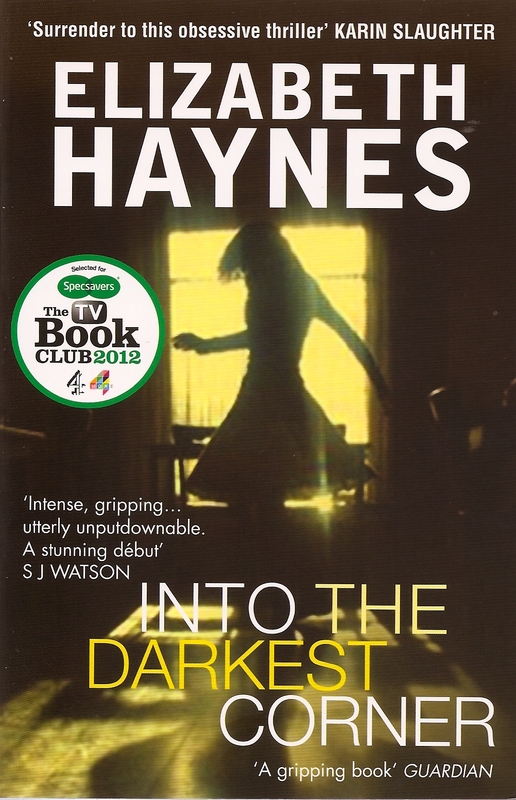 Therefore I decided to read Into The Darkest Corner the debut novel of Elizabeth Haynes. This novel had come highly recommended Amazon Best Book of the Year 2011, Winner of Amazon Rising Star 2011, and blurbs from Karin Slaughter, S.J.Watson and the Guardian. But more importantly it had a favourable blurb from my friend, Rhian Davies, CWA John Creasey Dagger judge, aka Crimeficreader. This is a brilliant book which after a brief but important preamble tells the story of Catherine Bailey in two separate time frames each one dealt with in alternating chapters. Firstly we are in Lancaster in 2003 as Cathy meets and gets involved with Lee Brightman, a handsome charming young man, who the sociable, effervescent, and sexually liberated Cathy finds very attractive. All her young girl friends also lust after the dishy Lee, usually a sign of trouble to come in novels and real life. Once I had got into this book, which was very different from the rest of my current reading, I literally could not put it down. The narrative fairly roared along to the conclusion. Possibly one of the reasons I enjoyed the book so much is that Stuart works and Cathy seeks treatment at the Centre for Anxiety Disorders and Trauma at the Maudsley Hospital in Denmark Hill. I lived on Denmark Hill only a couple of hundred metres from the Maudsley in the late 1950s and early 1960s, an age when mental illness was not regarded in the same enlightened way as today. The characters are so well drawn that it is sometimes very easy to identify them as people we have known in real life. [Including a violent real life Lee who murdered his wife] The twin stories are told in the first person a difficult technique but one which adds enormously to the mounting tension. I’d always thought that women who stayed in abusive relationships must be foolish. After all there had to be a moment, a realisation that things had taken a wrong turn and you were suddenly afraid to be with your partner-and surely that was the moment to leave. The book is not faultless, the two short prologues remove a lot of the mystery concerning what has happened in the past to Lee and Cathy. But this is a very good thriller with a lot of relevance for today’s young people as they deal with difficult relationships. I’m glad you liked this one Norman – I did too (as I would given dear Maxine recommended it to me) – the way she depicts the woman as getting slowly ensnared by the abusive chap is so realistic – and yes such a good example to people of how you often can’t see it until it’s too late when you’re in the middle of such a thing. Bernadette, this book was so frighteningly realistic that I think that my 14 year old granddaughter should be grounded until the twelfth of never.